DANCING WITH THE STARS Jaleel White TOTAL BLACKOUT Sneak Peek! We reported on a new Syfy game show that was introduced at the Syfy press tour in October of last year called “Total Blackout”. Syfy has just released a new trailer for our viewers to watch below. “Total Blackout” is a cross between “Fear Factor” and “Killer Karaoke” blindfold challenge. Contestants have to sometimes touch really gross things, sometimes not, blindfolded in complete darkness. 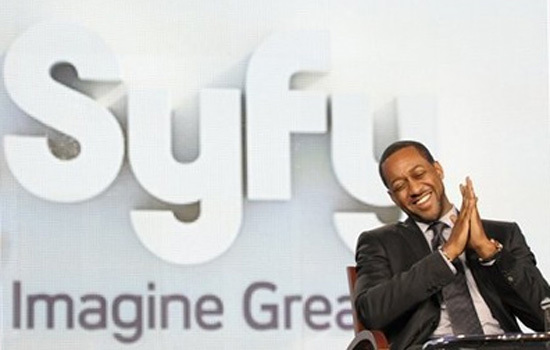 New season of “Dancing with the Stars” contestant Jaleel White best known for his “Steve Urkel” character on “Family Matters” is the host of this unique concept game show. During a Syfy press conference held in October, we got a sneak-peek of the show from the executive producer, Henrik Nielsen who did a live run-through in a separate room. Nielsen said he got the idea for the show from a childhood experience where he pretended to have a spider and chasing four sisters with it. They knew that he hated spiders and had no spider, however, “they were still terrified”. Nielsen explains the show concept, “one of the key elements in the show is that the viewers know more than the contestants. So when you enter the room, we will always, as a viewer, know more than you as a contestant, and that’s where the humor comes in.” He compares it to when he chased his sisters with a spider, but he didn’t really have a spider. White agrees with Nielsen that “It’s the part of the psychology of it”, and that it’s about what people expect. “Total Blackout” premieres Wednesday, April 25th at 10 pm on Syfy.